There is not much information I could find about this product in English. Skeyndor is a brand from Spain with high-end prices. I guess this is a salon product in Spain but don’t quote me on this. I love moisturising products but instead of the cream meant for drier skin types, I opted for this emulsion which is meant for normal to combination skin because I want to play it safe as thicker creams tend to be pore clogging. The texture is like a light lotion and after using it for a month, I still have a lot of the product left. 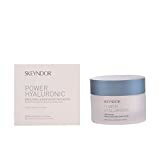 Skeyndor Power Hyaluronic Intensive Moisturising Emulsion contains 0.25% hyaluronic acid and sunflower extract. I am very clog-prone so I was worried that this emulsion would clog my pores as it contains sunflower oil and glyceryl stearate but it does not clog my pores at all. This goes to show that you can’t really single out a product due to their ingredients. Formulation plays the ultimate role. For such an expensive moisturizer, you would expect the brand to pay attention to the little details but unfortunately this product does not come with a spatula! It’s not a big deal as I have other spatulas on hand. I quite enjoy using this cream. It makes my skin plump, healthy and glowing! Despite its moisturizing power, it is not oily. Many people would love the texture of this cream. It definitely improves my dehydrated skin and make it look smoother and moisturized. My skin feels comfortable with this moisturizer even in an air-conditioned room. I rarely try European skincare products but I have to say this cream really impresses me and it is even better than some of the high-end Korean moisturizers I have tried (gasp!). Would I repurchase this moisturizer though? I would not repurchase this soon after I have finished using it as I always like to try new products because I get bored quickly. However, I might come back to this product one day since I love it. I look forward to trying new products from Skeyndor as their products look so promising just from my result of using this cream!